Preventing or controlling blossom drop of tomatoes can be possible if you know what causes their blossom drop prematurely. About 2 years ago, I had lush green healthy tomato plants in my garden, each having a very large number of blooms. I thought, I was going to have a record crop of tomatoes that year. But I was disappointed and became extremely sad and frustrated to see that most of the blossoms fell down prematurely and none of them had set as fruits. The natural problem is why do tomatoes flower but no fruit, there are tomato flowers but not setting fruit! Why my tomato blossom drop or drying up and not producing fruits? What is the reason for blossom drop and getting no fruits in spite of lots of blooms? Tomato Nutrition Facts | Cooked tomatoes better than raw ones? If you have lots of flowers and no tomatoes, temperature, humidity and poor pollination are generally the cause (Growing tomatoes in pots). 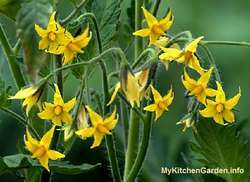 Well, several other factors can cause to flowers to drop and failure of fruit setting and no tomatoes. Some tomato blossom drop is normal. When the plant has too many flowers, the fruits are all competing for the limited food supply. So the plant will automatically drop some flowers and only the strong will survive. The tomato variety you have planted might be the problem. Always buy the seeds or seedlings from your local nursery. Choosing a suitable variety according to your area and keeping your plants healthy will reward you with plenty of tomatoes. The area of my kitchen garden bed where I was growing tomatoes lost direct sun light for most of the time during the day due to the growth of tall trees in my neighbour house. If you have planted your tomato plants in shade or your plants are not receiving 6-8 hours of sun light, then your plants may not bloom or may produce only a small number of flowers and fruits. With poor light, your tomato plants will grow poorly as the plants are deprived of energy, which they get from the sun. If you have planted your tomatoes too close (less than 2 ft apart), they are more susceptible to disease due to poor air circulation, which can cause blooms to drop and result in no fruit. The ideal humidity range for fruit set is 40 - 70%. Outside this humidity range, the release of pollen and their ability to stick to the stigma become reduced. So pollination will not occur. In high humidity areas choose for tomato varieties that are not affected by humidity. Some of these are Grosse Lisse,, Eva Purple Ball, Flora-Dade, Jubilee, Moneymaker, Sun Gold, etc. Hose the foliage during the day, if humidity is too low. Tomatoes need deep watering because they have deep root systems. If your tomato plant is receiving too little water, it can weaken your tomato plants and may produce only a few flowers and fruits. Your tomato plants should get 1-3 inches of water a week. Water your plants 2-3 times a week deeply to allow root systems to grow strong. If tomatoes fail to bloom, the reason may be too low or too high night temperatures. If temperatures are consistently below 10C or above 30C, most tomato plants will fail to bloom and force the plant to focus on surviving. Low temperatures will cause harmful curled and leathery leaves. Choose types of tomatoes tha are most appropriate for your climate and do not plant tomatoes too early in the season. I you are using a too much high nitrogen and low phosphorous and potassium fertilizer, your tomato plants will produce a lot of leaf growth with little flowers. Tomatoes are heavy feeders. Feed you plants with a fertilizer with the phosphorus more than the nitrogen every 3-4 weeks, NPK may be 2:3:1. Could feed with a liquid fertilizer for fast absorption. If the soil is deficient in sulphur, phosphorous or potassium, then it may affect blooming and fruit formation. Sprinkle one tablespoonful of Epsom salt (magnesium sulfate heptahydrate) around your plants. When temperatures and humidity are not favourable and bees are not active in your garden, too less blossoms are pollinated. You can try hand pollination of tomatoes.